"The Baylor Music Education Program was not only the best four years of my life, but it provided me with a firm foundation upon which I built my musicianship, artistry, professionalism, appreciation for education, and desire to teach and mold fine musicians. My time there grew me into a capable and prepared teacher." 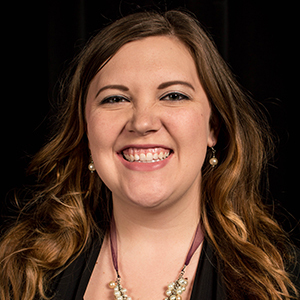 Courtney Neva (Baylor BME, 2009) currently serves as the Assistant Choir Director at East View High School in Georgetown ISD (Georgetown, TX). Ms. Neva is a graduate of the Baylor School of Music, having earned a Bachelor's of Music Education Degree with a Choral Emphasis. Currently, Ms. Neva is in her seventh year of teaching, and has previously taught in Austin ISD at Fulmore High School, and in Clear Creek ISD at Clear Lake High School. Additionally, Ms. Neva has been involved in numerous choral ensembles and music organizations, including the Baylor A Cappella Choir and Chamber Singers, the St. Matthew's Episcopal Church Choir in Austin, TX, the St. David's Episcopal Choir, the Amphion Youth Choir, the Conspirare Symphonic Choir under Craig Hella Johnson, and currently serves on the worship music team at Life in the City United Methodist Church. She is also a member of such professional organizations as the Texas Music Educators Association and Texas Choral Directors Association, and is a faculty sponsor for the East View Chapter of Texas Future Music Educators (under TMEA), and The Ruby Slipper, a student-led organization whose mission is to inspire and empower young women.